Food gives us so many reasons to fire up the grill this time of year. One of my favorites is grilled corn on the cob -- a fleeting pleasure with a very short seasonal window that we are lucky to be entering right now. But after all the steaks and burgers and veggies come off the grill, the party doesn't have to be over. There are plenty of burning embers left to give a glorious char to, of all things, a dessert course! It is very easy in the summer to fall victim to the smell of s'mores. The bounty of Mother Nature, however, offers an incredible buffet of fruits that improve even more immensely from the lick of flames than the marshmallow does. The alchemy of sugar and smoke creates complex, interesting flavors that refresh as well as satiate cravings for sweets. Like most of us - I must remain ever vigilant to keep my raging sweet tooth in check. I have finally figured out that there is not much good fighting it, I just have to make smart decisions when it comes to ending my meal on a sweet note. Fortunately, this time of year makes that healthy decision very easy! Just a trip to the farmer's market or grocery store will reveal piles of fragrant, juicy stone fruits in a rainbow of colors. August marks the beginning of the season for nectarines, peaches, plums, apricots, and all of their beautiful hybrids. The berries are frittering out for the season and we are still a month or two away from harvest baskets of apples and pears and figs. Stone fruits bridge that berry/apple gap quite nicely. I don't think it is a coincidence that the stone fruits' season coincides almost perfectly with lazy-days-of-summer prime grilling time! Even if you never considered yourself a plum or apricot fan, cutting those babies in half and tossing them on a hot grill for two or three minutes will open your eyes to the possibilities of grilled fruit desserts. That's all there is to it. Wash your fruit, cut it in half, and set it (cut side down) on the hottest part of the grill just until it softens to the touch on the upper skin side. The skin will soften and give way to tender, juicy flesh inside. The fire concentrates the flavor of an otherwise bland or slightly unripe fruit while the fruit's natural sugars caramelize.. A little char on the edges and grill marks on the fruit's flesh will not only make it photograph beautiful, but also add a level of texture that just can't be matched with any other cooking method. One of the beautiful things about grilling fruit for dessert is that prep time is really minimal, as well as cooking time, so dessert can be a spur of the moment course easily prepared after dinner is eaten. Who doesn't like to end a meal on a sweet note? 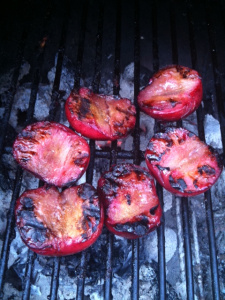 The hardest part of grilling stone fruit is prying the flesh away from the pit in the middle after cutting it in half. If you frequent farmer's markets, ask the growers which fruits are "freestone" varieties. Those varietals of peaches, nectarines, and plums will come easily away from the pit, making preparation a breeze. If you happen to buy a "clingstone" fruit, where the flesh, as the name suggests, clings stubbornly to the pit, just use a paring knife to cut the flesh away. It may not look pretty, but trust me, once you grill it and top it with something delicious, no one will care. To really maximize the impact of grilled fruit, it is never a bad idea to top it with a little scoop of sorbet or ice cream, which melts as it sits on the warm fruit, creating a delicious sauce. To really guild the lily, I like to throw a few toasted, chopped nuts on top to add another layer of flavor and texture. Add a leaf or two of your favorite sweet herb (mint, basil, lemon balm) for a truly spectacular presentation. Grilled desserts can even be done with tropical fruits available any time of the year. These fruits require slightly different preparation, but yield equally wonderful results. Once again, throw the fruits on the hottest part of your grill for just a few minutes. Grilled fruit is truly dessert for the impatient! Use your imagination to come up with new favorite combinations. Pick a fruit that smells luscious, pair it with something frozen that you love, and treat your guests to a hot & cold experience that they will want to repeat again and again. If you are asked to bring dessert to a party, you will get rave reviews for showing up with a couple of pineapples or a big bowl of nectarines to throw on a hot grill.